A solo exhibition at Ceri Hand Gallery's Liverpool space (2009), bringing together a new sculptural installation and poster works. The central sculpture was an interpretation of a ‘shot-gun shack’; a traditional American dwelling, so named as the rooms are all aligned, making it technically possible to fire a shotgun through the front door and out the backdoor without hitting anything. 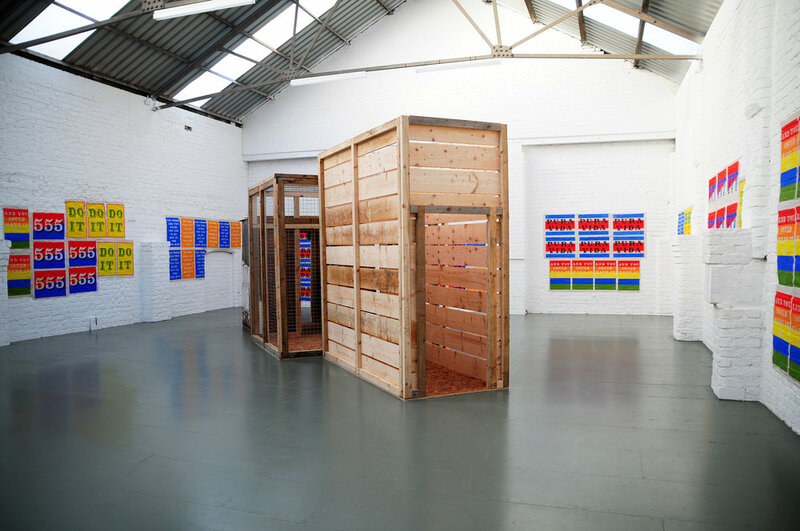 This was a sculptural triptych, the three rooms referencing different spaces we/people inhabit; a shanty town structure made from locally scavenged materials, another based on the exact dimensions of the holding cells at Guantanamo Bay and Camp X-Ray and a third based on the dimensions of the deepest grave legally allowed to be dug in the UK. Pasted around this on the walls of the gallery were screen-printed posters. These drew on a diverse range of references including song lyrics, the 5 colour codes in place to alert the West of potential terrorist threat and urban mythology/misinformation. Viewers of the work were allowed to enter and pass through the sculptural structure. Download a PDF of a catalogue produced alongside the show that details past projects and includes an essay by Andrew Hunt and an interview with Ross Sinclair.